The northern Indian state of Uttar Pradesh has attempted to set a world record by planting 10 million trees in a single day on Tuesday. Officials say the plantings, aiming to raise awareness of the need to protect the environment, were a success. In all, 10,266,736 saplings were planted at 9,320 sites across Uttar Pradesh's 70 districts. The authorities say they have notified Guinness World Records of their attempt and are awaiting confirmation. The record stands at 852,587 trees, planted in 6,284 locations in Tamil Nadu state in 2006. The location of the sites were recorded using GPS technology so the record could be independently verified, forestry officials told the BBC. Almost the entire state machinery, educational institutions and a large number of farmers were geared up for planting the trees, says the BBC's Ram Dutt Tripathi in the northern state's capital, Lucknow. The programme has been included in The Billion Tree Campaign being run by the United Nations Environment Programme. 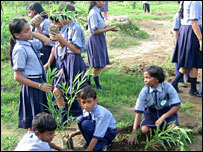 Banks and other institutions provided the financial help needed to procure saplings. BK Patnaik, chief conservator at the state forest department, said: "The response from the people was overwhelming and heartening." The leader of India's governing Congress Party, Sonia Gandhi, planted a sapling in her parliamentary constituency of Rai Bareli. In the western district of Hathras, some 40,000 trees were planted in one location. India's forest policy is committed to having at least one third of the landmass covered with trees and forest for ecological balance, although the actual covered area is only 24%, our correspondent adds. Although Uttar Pradesh is India's most populous state, its tree-covered area is only 9%. Officials say they are also planning to amend forestry laws to encourage people to plant trees on their private land.